Enjoy a more reliable and stable flight with the new OcuSync 2.0 system, which supports automatic dual frequency band switching and extends flight range to up to 8km . The remote controller, drone, payloads, RTK module, and RTK base station, can now be upgraded simultaneously with just 1-click in DJI Pilot or DJI Assistant 2. Gain improved relative accuracy with centimeter-level precision positioning data using the D-RTK 2 Mobile Station, which supports all major global satellite navigation systems and provides real-time differential corrections. Connect any compatible payload above your M210 V2 and M210 RTK V2 drones using the upward gimbal to capture data from a different aerial perspective. Enhance positioning accuracy by using an external GPS module, especially when using an upward gimbal on the M210 V2, or when attaching onboard devices or payloads. DJI Pilot is an app developed specifically for enterprise users to control and customize their DJI drones. With development made specifically for the M200 Series V2, DJI Pilot optimizes your flight capability for peak performance. DJI FlightHub is a one-stop solution for managing your drone operations, supporting large organizations to effectively scale their aerial operations. Compatible with the M200 Series V2, you can integrate FlightHub directly into your existing fleet of DJI drones and leverage its aerial intel across your organization. 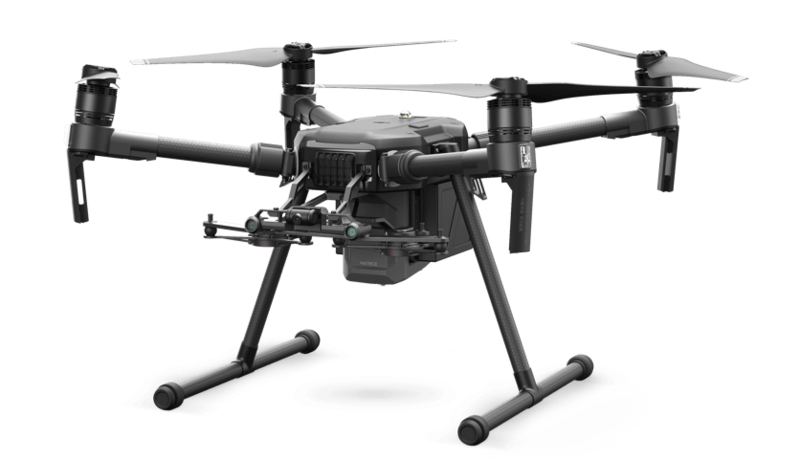 Build imaging or robotic tools for your specific workflow needs and integrate them seamlessly on the M200 Series V2 drones. Thanks to the TimeSync feature, third-party payloads can have the position data fixed to the center of the gimbal connector for precise geotagging. Integrate an onboard computer to analyze in-flight data, or connect third party devices. Increase operational efficiency and quickly respond to issues while keeping personnel safe. With the use of thermal and zoom cameras, officers can immediately gain accurate information from the air. Improve inspection efficiency and accuracy while lowering costs and keeping personnel safe. With the use of thermal and zoom cameras, teams can pinpoint temperature abnormalities and asset defects quickly from the air. Improve inspection efficiency and accuracy while lowering costs and keeping personnel safe. With the use of a zoom camera, teams can identify structural weaknesses and defects quickly and accurately from the air. Currently supports DJI Zenmuse X5S, Zenmuse X7, Zenmuse X4S. Support for additional payloads is coming soon. Acquired at a constant speed of 25 kph, free of wind. Actual flight time may vary because of the environment, use of flight modes, and or accessories. The M200 Series V2 is available for order through official DJI Dealers. Contact us below for the team to reach out. Build to Endure. Engineered to Adapt.